A gyrocompass detects the direction of true north by means of a fast-spinning rotor, which is suspended with no friction and is influenced by gravity and rotation of the Earth. A gyrocompass consequently indicates a ship's heading. The ship's heading is transmitted to repeater compasses and other ship's equipment after the signal format is converted to serial data or to stepper or analog signals depending on what type of format the equipment requires. 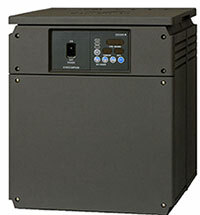 CMZ900 series facilitates easy construction of customized systems. Improved vibration- and shock-proof mechanism, realized by adopting a universal joint and an outer bellows damper in addition to the rubber isolator and the existing bellows damper. With the reduced size and weight of the container and the improved followup speed, the gyrocompass allows repeater compasses to keep smooth, synchronous track of it even in the case of fast-turning small vessels. The master compass and control box of the CMZ900S can be installed in the autopilotstand. The restart time of the CMZ700 series can be set from 1 to 99 hours. Environmental Parameters Mechanical freedom Max. permissible roll angle: ±40 deg. Max. permissible pitch angle: ±40 deg.